In our previous post giving you sample training needs analysis questionnaires, many readers asked for more samples. We did not create our own sample for the previous post. Now we have. Below you will find a training needs analysis questionnaire you can use or adapt to your own company’s needs. There is no single type of training needs analysis questionnaire. There are countless versions, as they vary with the user’s industry and needs. This sample training needs analysis questionnaire is just one example, and you can edit it to work for your own business. Please do not ask us to email you other types of questionnaires. This is the only one available, and we do not create custom questionnaires for each reader. It’s easily customizable — just use it as a model and plug in different skills that are most important for your own business. If this one doesn’t meet your exact needs, you can find numerous other examples by searching Google or you can create your own custom template (which is ideally what all HR reps would do, to make sure the questionnaires are appropriate for their personal goals). The questionnaire below relates to hiring sales staff for a business. The skills included are those companies would generally find important in their sales representatives who are dealing with customers directly. We hope you find it useful. If you want to use this questionnaire as-is, download and print the .pdf version. In the questionnaire below, place a check mark in the column that reflects your current level of skill or ability for each skill listed. Rank your skills on a sliding scale, with 1 being poor or beginner-level skills and 5 being strong skills or more advanced experience in that area. Your responses will help us determine your current skill set, so we can plan the most effective training program to help you excel at your job. Whenever you’re conducting a training needs analysis, you’re looking to evaluate the current skills of your staff so you can figure out what areas they need the most training in. Having a proper training plan in place means that workers can work more productively and efficiently, because they’ll have the skills they need to get the job done right. 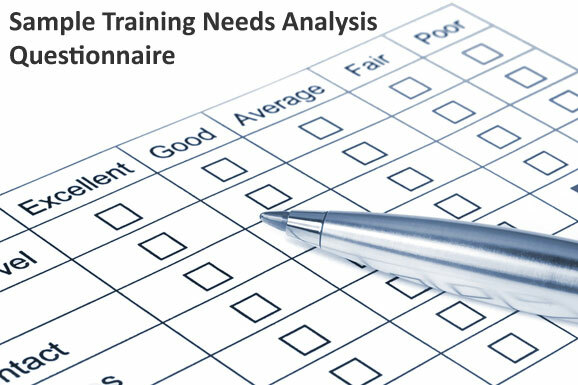 After distributing a training needs analysis questionnaire like the one above, you have to analyze the results. The first step of doing that is deciding which of the skills listed are the most important to your business. Mark them or highlight them. Then look at those most important skills and see which of them has the lowest ranking based on employee feedback (the most 1s and 2s for example). These should be your priority areas for employee training. They’re the weakest skill sets in the most important areas for your company. Once you’ve taken care of training in those areas, you can decide if the questionnaire results show training in other, less important, areas is also worth pursuing. You may also enjoy reading Why Kinesthetic Learning Really Works in Classrooms Today. Do you have a training/skills needs analysis questionnaire for participants of a community development project? May I ask a favor from you to have a sample copy of a questionnaire that relates to my present study which is entitled: “Needs Analysis of English Language for Secondary Schools: Basis for a proposed faculty development plan”. Hoping for your generous help with this matter. I am Reymond A. Mosquito, working in St. Paul University Surigao and currently enrolled in Thesis writing. You can e-mail the said sample in my yahoo mail monrey_m@yahoo.com. Thank you very much. do you have a tna for public speaking? has anybody got a really good TNA questionnaire for Customer Services? please send me questionnaires on training and development for employees working in the ancillary, general services, administrative and nursing of the hospital. Specifically on supervisory, decision making and implementation of discipline. I work for a project called horticulture and Livestock project , in Inistitutional Capacity Building Componenet. I am going to conduct a very simple but usfull Training need assessment in District office of Ministry of agriculture and livestock. I wand to assess all level of staff there. Please send me some sample questionnaire for training of employees. In which I can guess that what training they want and what is their interest level? isbpak14@yahoo.com. HR & Training Consultants are requested to help me. please help me with a sample questionaire on the impact of training on employee performance.